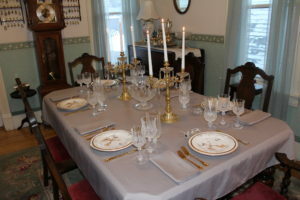 For the formal dinner table setting, I used the same tablecloth but used the matching napkins for a more formal feel. Both plates remained, but I swapped out the Titanic flatware for Wm. Roger’s and Sons Golden Royal Plume to go with the trim on the plates (purchased at an antiques store in Uptown Butte, Montana). Stemware and centerpiece bowl is Longchamp by Cris d’Arques (thrift store). I also used individual salt and pepper cellars at each table setting. The square ones meant for pepper were a rummage sale find many years ago. The cut ones are a gift from a friend. They came in their original box, and all of the little plastic salt spoons were still there. 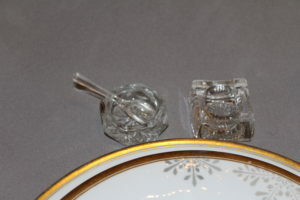 I don’t believe this set was ever used, because the labels are still on each of the glass salt cellars-handmade by American Cut Crystal Company, Czechoslovakia. The candelabra flanking the centerpiece bowl are made in Spain and a lucky thrift store score. Individual salt and pepper cellars at each table setting. Winter Deer formal table setting.